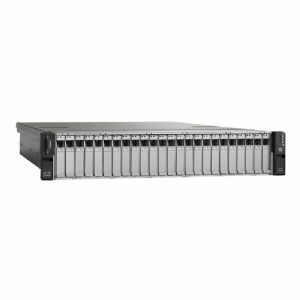 The UCS C240 M3 rack-mount server is designed for both performance and expandability over a wide range of storage-intensive infrastructure workloads from big data to collaboration. Building on the success of the Cisco UCS C210 M2 rack-mount server, the enterprise-class UCS C240 M3 server further extends the capabilities of Cisco's Unified Computing System portfolio in a 2U form factor. In addition, the UCS C240 M3 server provides 24 DIMM slots, 24 drives and 4 x 1 GbE LOM to provide outstanding levels of internal memory and storage expandability along with exceptional performance. Bays: 24 (total) / 24 (free) x hot-swap 2.5"